We had my favourite for dinner today – roast chicken – but I fancied something different to my usual full roast chicken dinner or roast chicken with salad. As it’s been a lovely, warm, day today I thought I’d go for a Mediterranean influence with smoked paprika and roasted cherry tomatoes, which turned out to be a fabulous combination. The tomatoes are actually fundamental, adding juicy moisture to a dish that could otherwise be a little on the dry side with no sauce or gravy, and complimenting the very subtle paprika in the chicken. I picked up some Jersey Royal new potatoes today so served those with the chicken too. They are in season now and are an absolute must-buy. These creamy, nutty-flavoured waxy potatoes are grown, as the name suggests, on the island of Jersey, and are considered by many to be the cream of the crop of new potatoes. With one bite you can taste why. Mix the butter with the zest of a lemon and a pinch of salt. Separate the skin from the breast by putting your hands underneath the skin and carefully tearing it away from the meat. Stuff the butter and lemon mix under the skin. Cut the lemon in half and put it in the cavity, then rub the skin with about a teaspoon of smoked Spanish paprika. Sprinkle over some sea salt and put the chicken in the oven. After 20 minutes take the chicken out of the oven and baste it with the fat that has been released into the tray. Turn the oven down to 190c and roast the chicken for another hour. Once the chicken is cooked through and the juices run clear remove it from the oven and set aside, covered in tin foil to keep it warm, for 15 minutes. Put the cherry tomatoes, still on the vine, in a roasting tray and drizzle over some olive oil. Roast these at 200c for 15 minutes while the cooking is resting. In the meantime steam the broccoli and boil the potatoes in salted water. Once the potatoes are cooked through (test by sticking a knife in to check they are tender), drain them and add a knob of butter. 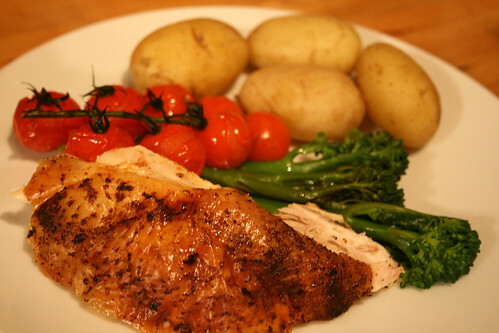 Slice the chicken and serve with the potatoes, broccoli and tomatoes.